The man to present the first ever model of an atom, the fount of knowledge, Niels Henrik David Bohr was born on October 7, 1885 in Copenhagen, Denmark. His father Christian Bohr was a professor of physiology at Copenhagen University. His mother Ellen Adler Bohr came from a wealthy Jewish family prominent in Danish banking and parliamentary circles. Niels was born in his maternal family home in ‘King Georg’s Palace’, considered to be one of the prominent and majestic private homes of Copenhagen. Niels Bohr had primary, secondary and university education in Copenhagen. He was a brilliant and industrious student. He and his younger brother Harold were good football players. They were proud members of the Danish football team. In the Scandinavian state too, they were considered as leading players. It is said that if you ask a Danish citizen about his pride in the four best things of Denmark, he would say: its prosperous shipbuilding industry, her prosperous dairy and cheese industry and her two prodigious sons – the famed artist Hans Christian Andersen and country’s greatest scientist Niels Bohr. The Danish Science Society had awarded a gold medal to Bohr for ingenious study of surface tension. His brother Harold became a great mathematician later. In 1911, Bohr completed his doctorate in physics. Then he went to London and under the able guidance of Sir J J Thomson, the ‘Father of Electron’, he started research at the Cavendish Laboratory. He then worked with Ernest Rutherford at Manchester for about four years. They remained good friends throughout their lives. Bohr even named his son Ernest after his dear friend. In 1913, Bohr presented his basic theory of the internal structure of an atom. Later, it underwent lot of changes and transformations over a period known as Bohr’s atomic model or Bohr’s theory of atom. This theory became very useful in the fields of chemistry and atomic science. Thanks to this theory that today so much development has taken place in the field of atomic energy. An atom is the smallest particle of an element that exists freely and takes part in a chemical reaction. Atoms of same or different elements combine to form molecules. Molecules form a solid or liquid or gas depending upon the intermolecular strength or force and conditions like temperature and pressure. An atom is made of two parts. Its core is known as nucleus which contains all the positive charge in the atom and almost all the mass of the atom. The electrons move at high speed in circular orbits around the nucleus. This is known as Bohr model of the atom. It can be compared to the solar system. In the solar system, the sum is at the centre and the planets and asteroids revolve around the sun in the specific orbits. Atom is very small. The diameter of atom’s nucleus is supposed to be 100000th part of an atom’s diameter. Electrons revolve around it at high speed. Hydrogen is the lightest element among all the natural elements. Its nucleus contains only one proton. It carries positive charge. An electron is electrically equal – same as that of the proton, but negative in charge. A proton is 1836 times heavier than an electron. In the hydrogen atom there is only one proton with one electron. The next lightweight element is helium. Its nucleus has two protons and two neutrons. Two electrons move around the nucleus. Uranium is the heaviest of all natural elements. It has 92 electrons, which revolve in 7 different orbits around the nucleus. Thus, in each element the number of protons and neutrons differs. Bohr, with the help of his atomic model and planck’s quantum theory, was able to explain the stability of the atom and the origin of atomic spectra. Normally, electrons revolve in their own assigned orbits in an atom. But when electricity or energy is passed trough an atom, the electrons quickly change their orbits and jump into a higher orbit. It returns to its original position in a short while. When electron moves to higher orbit it consumes energy and on its return, it releases energy. This release of energy is normally in the form of electromagnetic radiations. Bohr determined the atomic structure of matter by calculating the wavelength of the radiation produced during this process. Bohr’s work provided a major breakthrough in atomic physics. It dawned a new era in science. 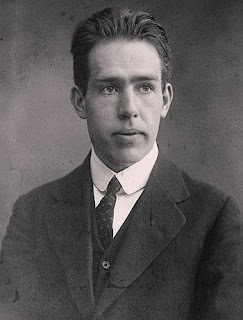 Bohr received the Nobel Prize for physics nine years after his wonderful discovery, in 1922. At 37 years of age, he was the youngest physicist to receive this honour. Prior to this achievement, he was appointed chairman at the Copenhagen based Institute of Theoretical physics. In a small country like Denmark, scientist from all over the world would gather at Copenhagen due to Bohr. Einstein had spoken the truth when he asked as to what would have been the state of atomic knowledge, had Bohr not been there. In 1939, a young Austrian Jew lady, Lise Meitner and her nephew Otto Robert Frisch came to Denmark from Nazi-infested Germany. They were appointed as researchers at Bohr’s institute to an article announcing that German scientists were working on their latest inventions and were planning to divide the nucleus of uranium into two equal parts. Bohr saw that if this was made possible, then immense energy could be produced during the process. It was also possible that Germans could use this technology to be powerful enough to destroy the world. Bohr rushed to America with this information. He discussed and deliberated on the issue with scientists Albert Einstein and Enrico Fermi. Fermi was working on this subject at Columbia University. It did not take much time for these eminent scientists to realize how dangerous it would be for the future of the world. The picture was very clear in their minds. Thereafter, America produced atom bombs and dropped them on two Japanese cities, Hiroshima and Nagasaki, to end the World War II. Bohr immediately returned to Denmark after deliberations in America. In April 1940, Germany attacked and captured Denmark, sending the king behind bars and stripping the army off weapons. They had planned to kill 6000 Jews living in Denmark. But about 5000 of them safety sailed to Sweden, thus failing the German plan. 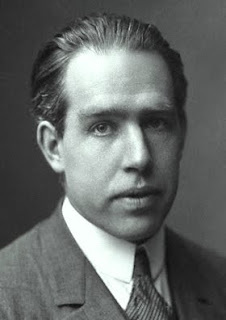 Niels Bohr, the son of a Jewish mother and his wife Margrethe Norlund were rescued in the dead of night, by the Danish resistance movement in a fisherman’s boat to reach Sweden safely. Nazis raiden Bohr’s residence, but fortunately, they could not lay their hands on the gold medal awarded as the Nobel Prize. Later, Bohr reached America and joined his son Aage, then working as a research physicist at Los Alamos in a nuclear project. Bohr returned to Copenhagen after the end of the World War II. He was deeply saddened by America’s attack on Japan. He advocated ban on nuclear explosion at international level. 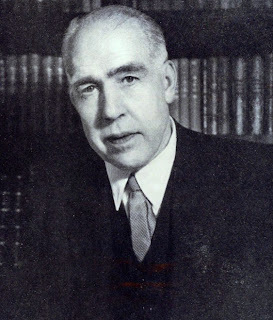 Bohr attended the peace conference at Geneva in 1955 as chairman of Denmarks Atomic Energy Commission. He was elected chairman of the conference. In October 1957, Bohr received the $ 75000 Atoms for peace Award from Ford. 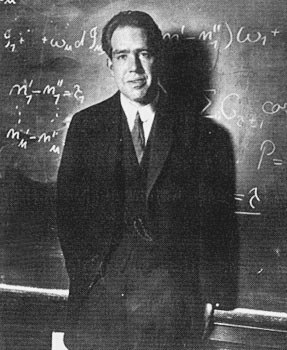 Bohr received the highest number of awards and medals in the world of science. Among his other researches, his work on the liquid drop model to explain nuclear properties and the principle of complementarity have played an important role in the development of modern physics. In his last years Bohr tried to point out ways in which the idea of complementarities could throw light on many aspects of human life and thought. He had a major influence on several generations of physicists, deepening their approach to science and to their lives. Bohr himself was always ready to learn. He drew strength from his close personal ties with his co-workers, his sons, wife and brother. Profoundly Danish firmly rooted in his own culture. This was symbolized by his many public roles, particularly as president of the Royal Danish Academy from 1939 until the end of his life. He died in Copenhagen on November 19, 1962.